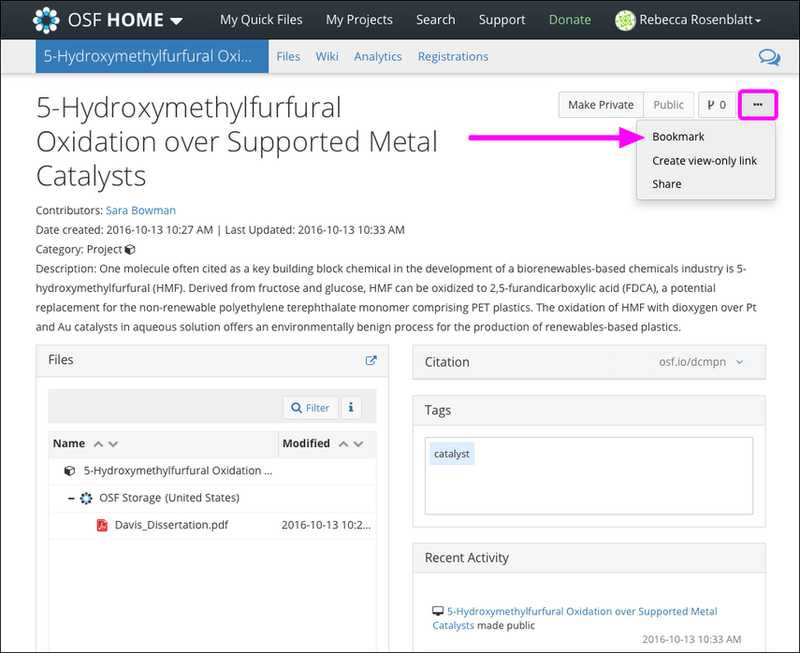 You can quickly access your OSF projects and components, registration, and preprints on the "My Projects" page. 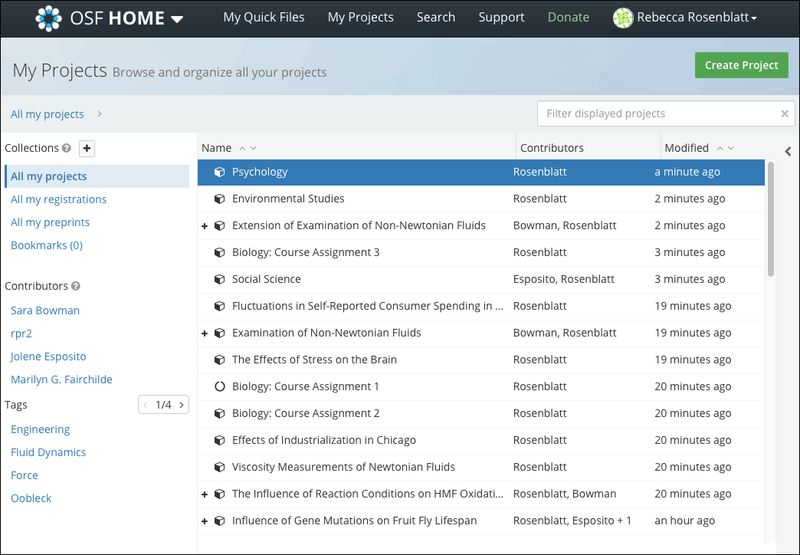 You can organize projects into Collections for easier access to your projects or other public projects. 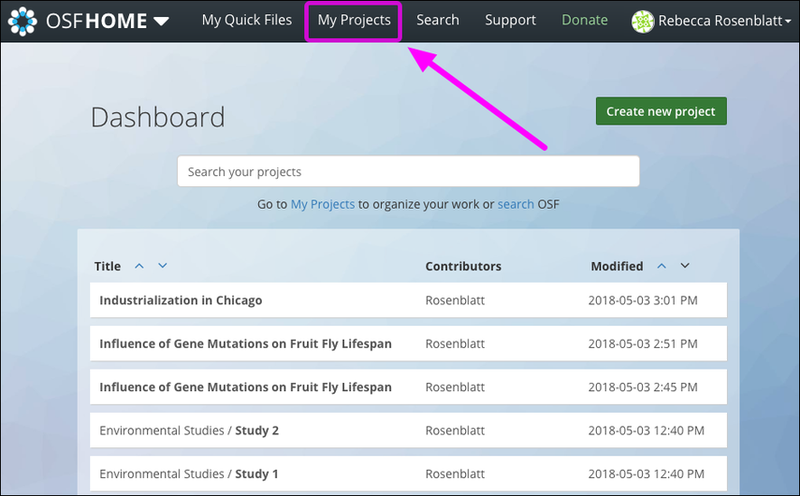 Sign in to OSF, then click My Projects in the navigation bar. 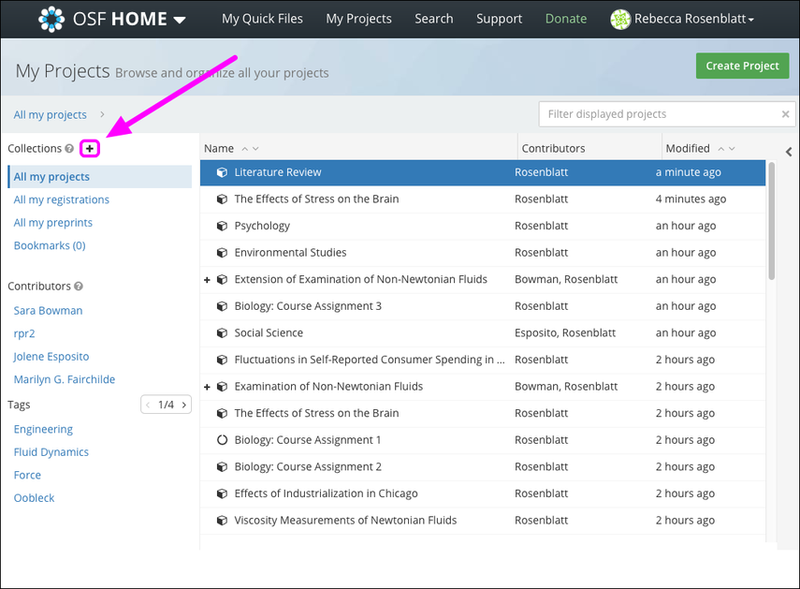 Your "My Projects" page will open, showing a list of all your projects. All my projects contains all of your projects and their components. All my registrations contains all of your registrations. 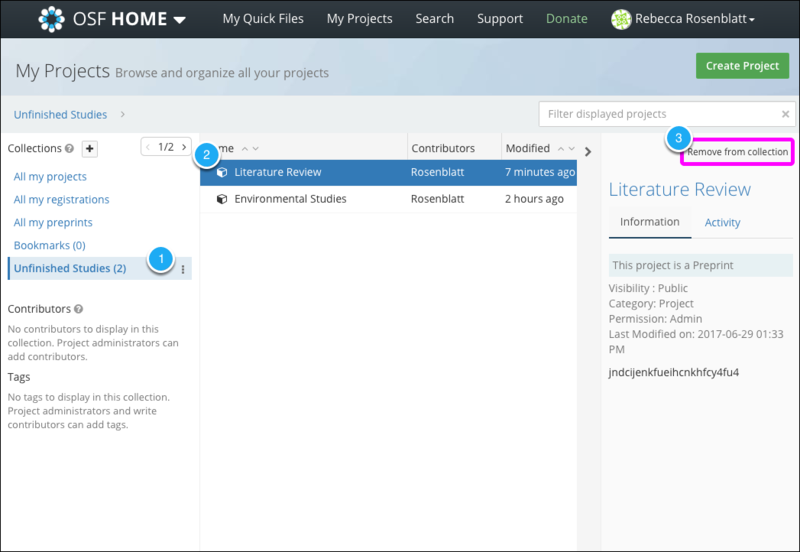 Bookmarks contains public projects that you have bookmarked from their "Project Overview" pages. 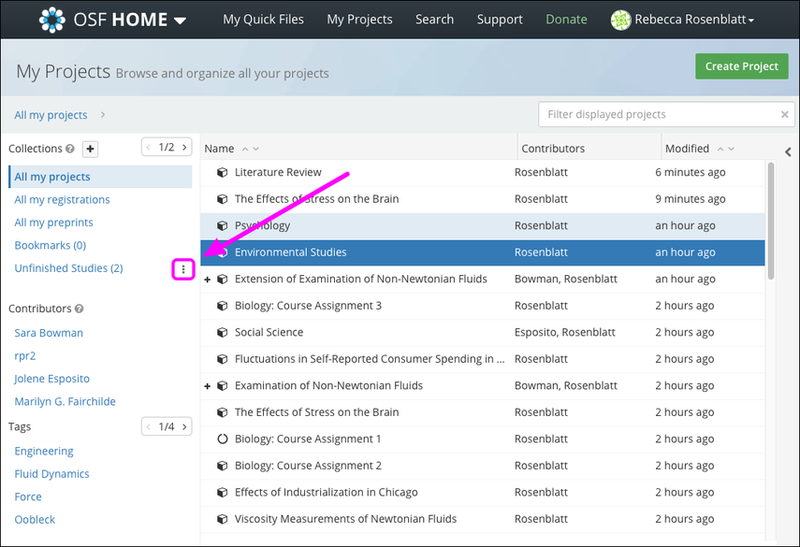 Click on one of your projects or components in the middle pane, and then click the left arrow in the top right of the page. 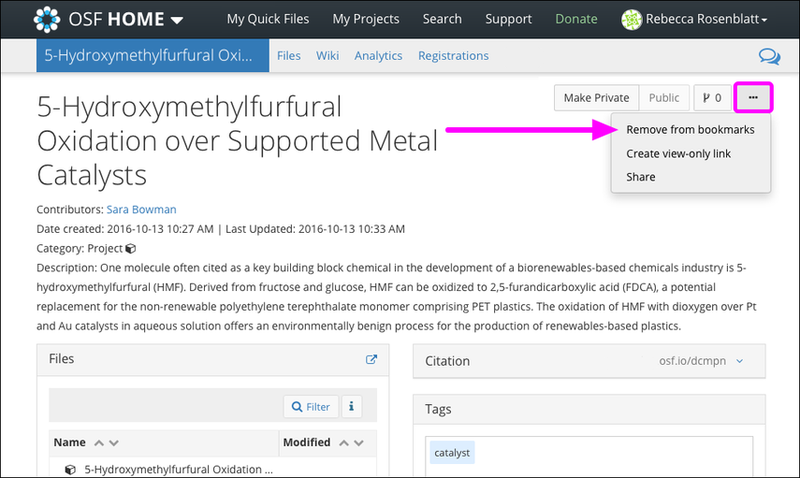 A preview of your project or component will open in the right pane. 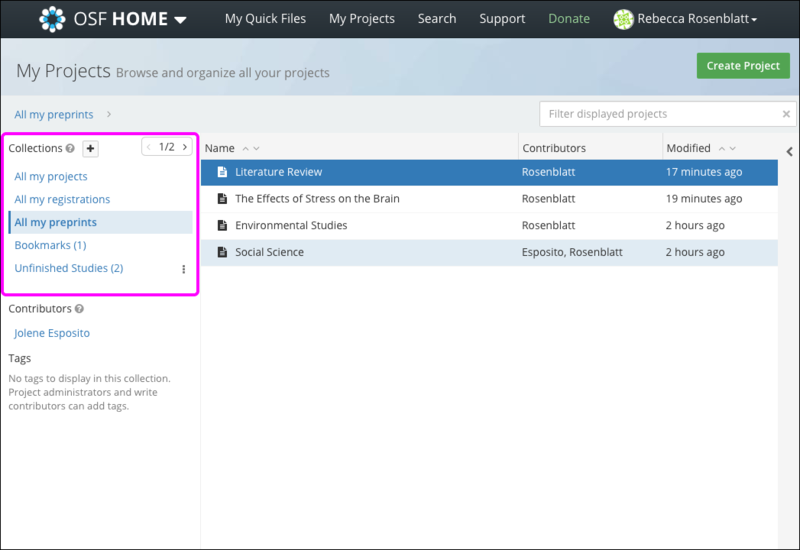 The "Information" tab shows details such as public/private settings, date last modified, project description, and tags. The "Activity" tab shows the most recent project logs on the project. Click a project or component name to go to the "Project Overview" or "Component Overview" page. A preview of your project or component will open in the right pane. 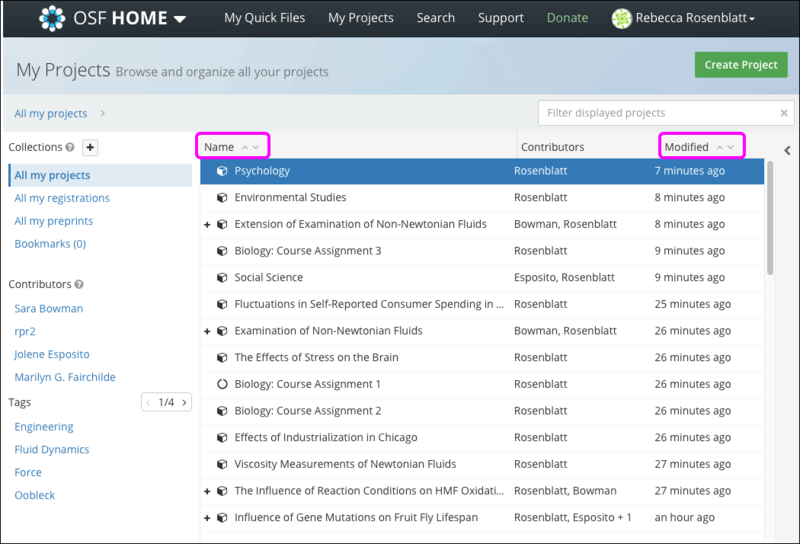 To sort by project and component "title," click the up or down arrows to the right of "Name." To sort by "date last modified," click the up or down arrows to the right of "Modified." Type project or component names, contributors, or tags into the textbox in the top right of the page to limit the results displayed. 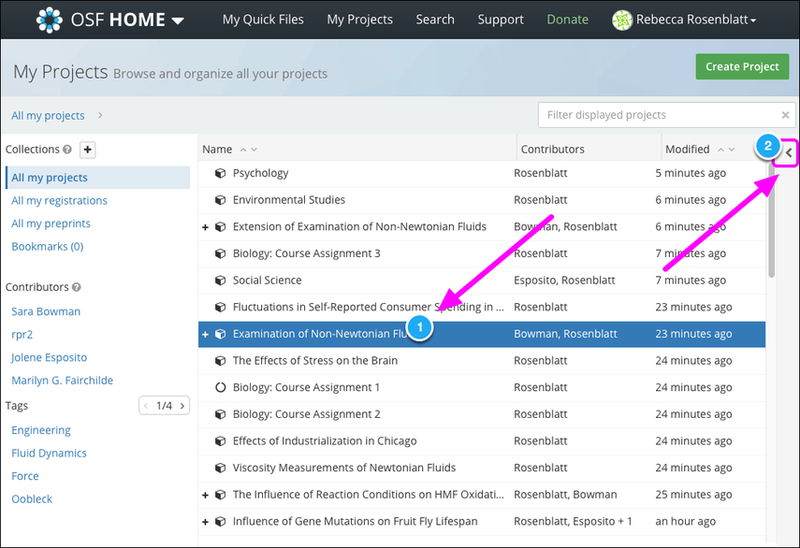 On the left side of the screen, click a contributor's name to display only projects you and that contributor share. 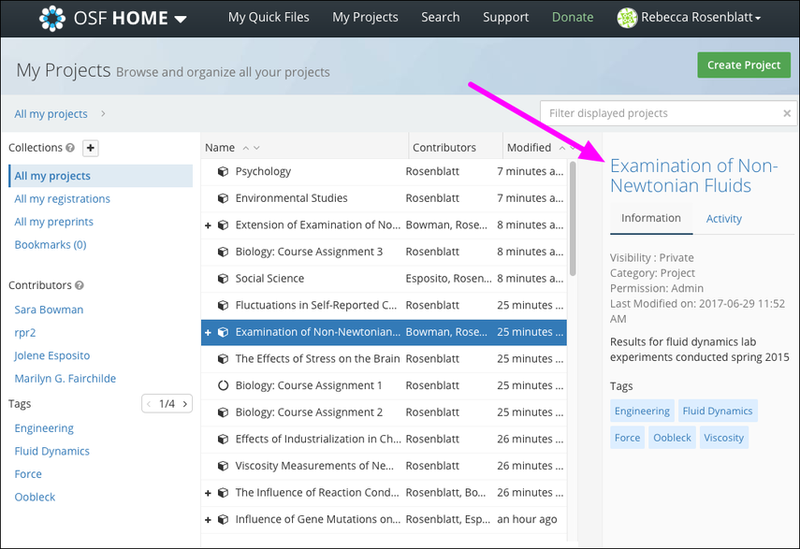 You can also click a tag to display only your projects with that tag. To remove these filters, either click the X next to the contributor or tag in the toolbar or click the All my projects Collection. Click All my projects, All my registrations, or All my preprints to see your projects and components within these collections. Note that if you have a private preprint, your preprint will not be displayed under "All my preprints." 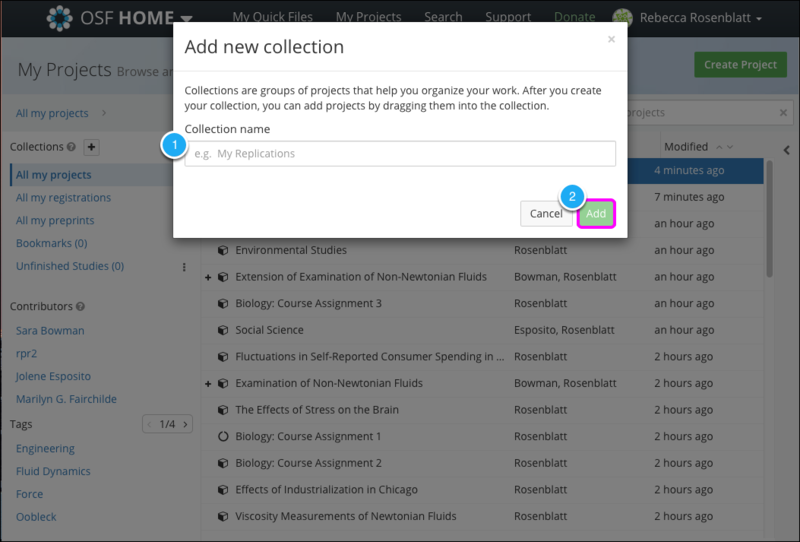 To create a new Collection, click the + sign to the right of "Collections"
The "Add new collection" modal will appear. Give your collection a name, then click the Add button. 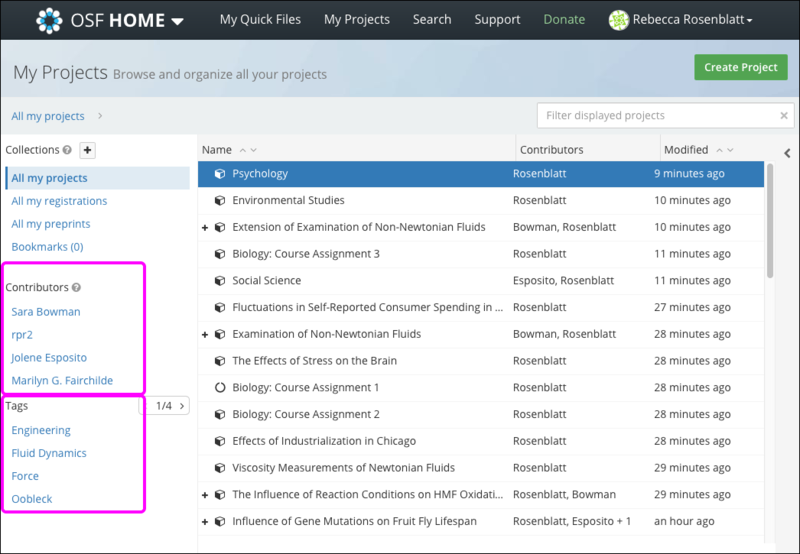 To add a project to a collection from the "My Projects" page, drag a project from the middle pane into a collection in the left pane. 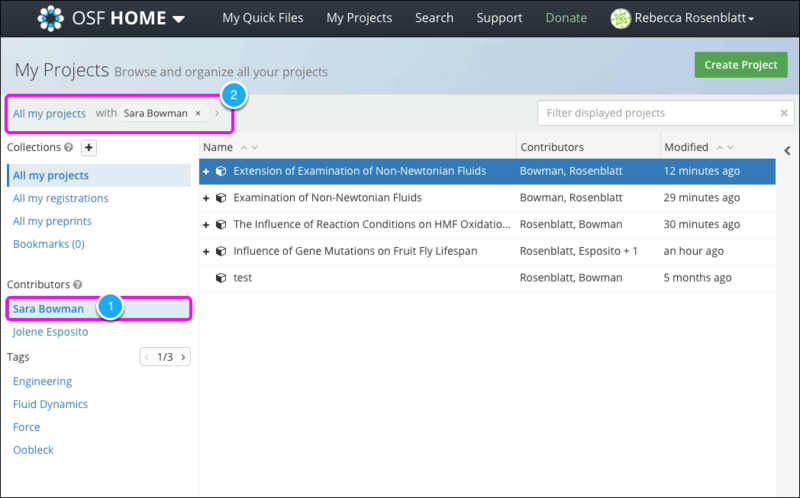 Please note that dragging and dropping projects or components into collections will not change the structure of the original projects themselves; the collections create a new way for you to access your projects and components. To rename or delete a collection, click the 3 dots to the right of its name. A popover will open from which you can click either Rename or Delete. Deleting a collection will not delete the projects within it. To remove a project from a collection, first click on a collection from the left pane. Next, click a project in the middle pane, then click the Remove from collection button in the right pane. 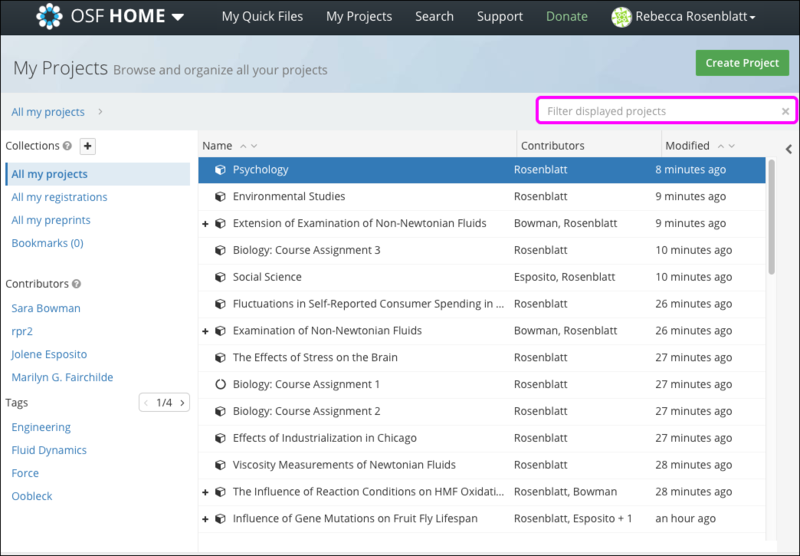 You can bookmark projects that are your own or others' public projects. Go to the project or component that you want to bookmark. Click the ellipsis button in the top right, then click Bookmark from the drop-down menu. To remove a project from your Bookmarks, click the ellipsis button again, then click Remove from bookmarks from the drop-down menu.